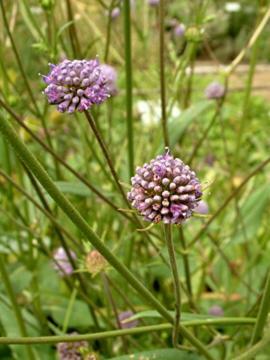 Wildflower with compact rounded heads of 4-lobed flowers, usually violet blue or sometimes pink, held on wiry stems. Rounded spear-shaped leaves. Moist soil in sun or part shade. Adaptable to most soils. Will grow by the coast. Native to Europe, inclusing Britain. Found in meadows, hedgerows and heathland, particularly in damp conditions. The common name comes from the bitten-off appearance of the roots.